Auto parts maker Motherson Sumi Systems Ltd’s shares jumped 6% as the company reported robust revenue growth across different regions. With 85% of its revenue accruing from overseas operations, the 15% growth in consolidated revenue is fairly impressive. The management also stated that revenue in overseas subsidiaries—Samvardhana Motherson Reflectec and Samvardhana Motherson Peguform—is steadily gaining traction in Europe, the US and even China. The company also maintained margins and consolidated operating profit rose 15% to Rs1,007 crore. The management attributed the flat margins to the product-mix in its sales during the quarter. Interestingly, in constant currency terms, the subsidiaries’ profitability was a tad better though still in single digits. These firms have come a long way in the last few quarters with a steady improvement in margins. On the other hand, the stand-alone entity’s margin, although way higher than the overseas operations, was just at the year-ago level of 21%. Be that as it may, what fuelled the stock was news of a 50% reduction in net debt. But this could be a temporary feature, as the firm has cash on its books resulting from a recent qualified institutional placement of Rs2,500 crore in domestic markets. The money would perhaps be used for expansion plans/acquisitions in the near-to-medium term. But steady growth in revenue and operating performance is likely to continue into the next few years. The company has a robust order book of Rs89,000 crore overseas, which assures revenue visibility over the next few years. Meanwhile, domestic markets are also proving to be more fruitful for auto component makers on the back of buoyant auto sales. 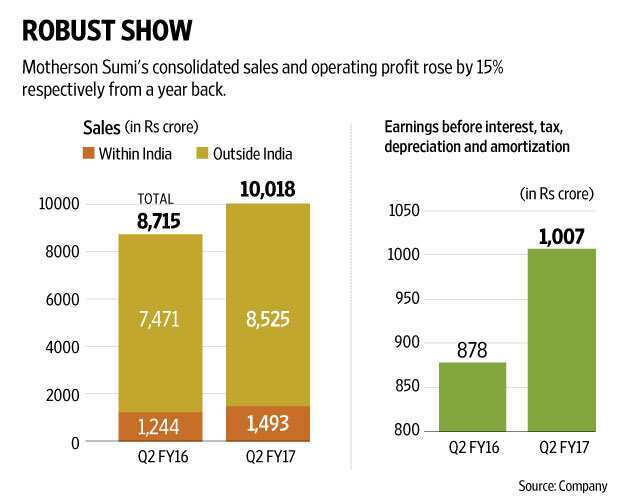 At Rs326, the Motherson Sumi stock trades at about 20 times estimated earnings for fiscal year 2018. From this level, the triggers could come from news on acquisitions and from margin improvement.